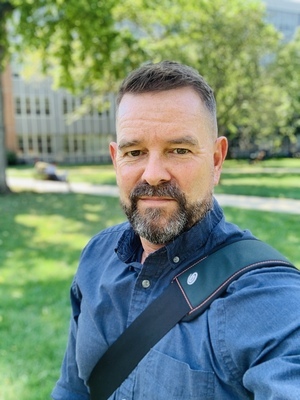 Scott Lloyd DeWitt, associate professor of English and vice chair of Rhetoric, Composition and Literacy, came to The Ohio State University in 1992. For ten years, he taught writing, developed academic programs and conducted research in computers and composition studies on the Marion Campus. An Ohio State Alumni Association Distinguished Teaching Award recipient for his pioneering teaching approaches with technology, DeWitt moved to the Columbus campus in 2002 to become the director of The Digital Media Project, the Department of English's digital media production and teaching studio. In 2002, DeWitt published Writing Inventions: Identities, Technologies, Pedagogies (SUNY, 2002), which offers instructional stories, histories and classroom applications and connects the theoretical aspirations of the field with the craft of innovative computer-enhanced composition instruction. Writing Inventions was awarded the “Computers and Composition Distinguished Book Award." In 2004, he directed the Battelle Endowment Institute for New Media and Writing Studies on the Ohio State campus. From 2007 to 2011, he directed the First-Year Writing Program. DeWitt is currently the editor of a scholarly collection of curated exhibits (with H. Louis Ulman and Cynthia Selfe), Stories That Speak To Us: Exhibits from the Digital Archive of Literacy Narratives (Computers and Composition Digital Press, 2013), and is working on a book, The Optimistic Turn: Authentic Contexts for Peer Review in the Composition Instruction, that examines a corpus of 5000+ pieces of student writing. For the past two years, he has been developing an online peer review application, The Writers Exchange, with colleagues in Rhetoric, Composition and Literacy.